We stayed in Lans-en-Vercours for about ten days, but there’s not much real climbing nearby, so we drove to all the rides. I drove to Le Bourg d’Oisans twice, once with Tanya to ride Alpe d’Huez and watch the TdF, and once by myself to ride a few other climbs. 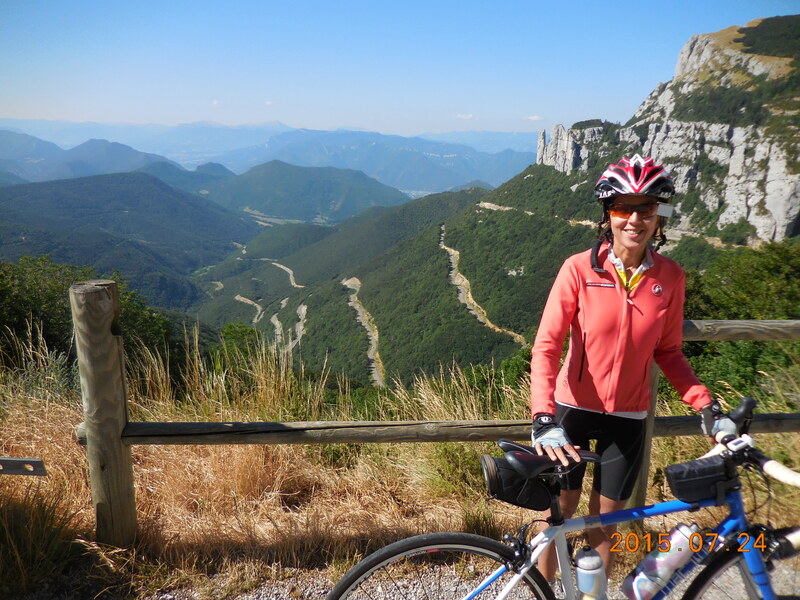 We drove to ride the Col de Rousset, the Col de la Machine, and the Col de Porte. I wrote about the climbs in Le Bourg d’Oisans in their own section, but the others are just included here. About 20 km and 858 meters (2,815′) of climbing. A lovely climb, never very steep, but in wonderful surroundings. We discovered this by chance as we had to drive over it on the way to where we were staying in Lans-en-Vercours. Start in Die and follow the road north, finishing at the tunnel. From Saint-Laurent-en-Royans. About 17 km and 850 meters (2,789′) of ascent. When I was looking for climbs to do around Lans-en-Vercours, I came across this profile on ClimbByBike.com. It has the most colorful profile that I’ve seen and for that reason I wanted to ride it. It’s a pleasant ride if you are in the area, not too hard, with little traffic, but no great views. There are two unlit tunnels, one of 120 meters and one of 255 meters. Lights are useful but not essential – there is just enough light to make your way through the longer tunnel. From Saint-Jean-en-Royans. About 12.25 km and 770 meters (2,526′) of ascent. 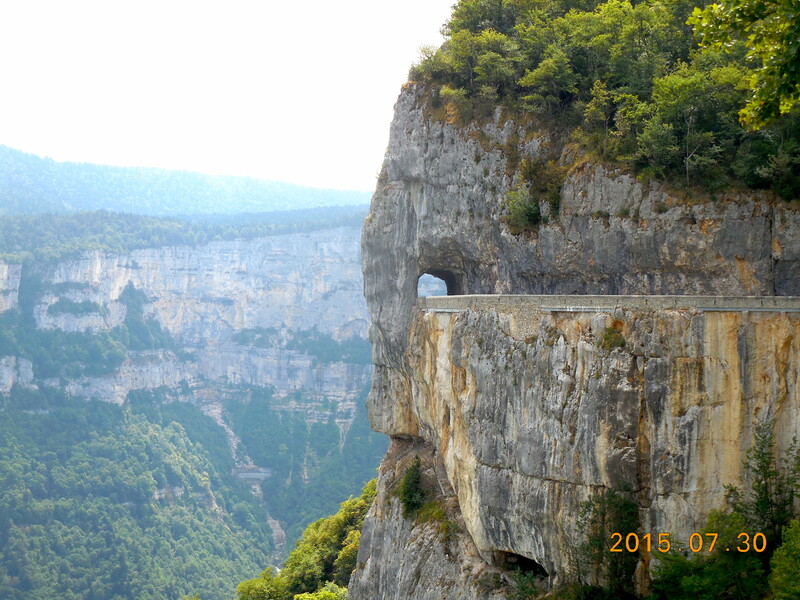 After doing research on Col de la Machine I discovered that the climb from Saint-Jean-en-Royans was written up in dangerousroads.com as being one of the most spectacular balcony roads in France. (It is written up twice: as the Combe Laval Road and as the Col de la Machine Road.) This of course meant we had to ride it. The first 8 km are pleasant with no surprises and a good road surface, but the 3 km of balcony road are just stunning with tunnels, cliffs, overhangs, narrow roads, and incredible views of the cliffs and the valley to the side. There is one lit tunnel of 190 meters. About 15.5 km and 1,100 meters (3,609′) of climbing. Not a very inspiring climb, and only worth doing if you are in the area. Tanya’s view is that you’d have more fun having a coffee and a pastry. We parked by the river just before the city limit sign for La Tronche. Ride into La Tronche and soon turn uphill following the sign for Col de Porte.